Just a few days after his 2009 inauguration, President Barack Obama published a memorandum on “Transparency and Open Government.” It instructed the departments and agencies of the U.S. government’s executive branch to start implementing the principles of open government. Government agencies of all levels today have a remarkable opportunity to revitalize themselves and respond more fully to citizens’ needs. They can tap new sources of information and ideas to assist in their work, and do this on a much larger scale than ever before. 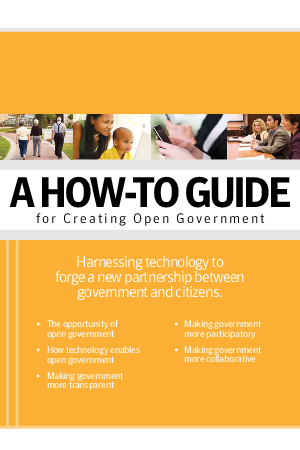 This How-To Guide for Creating Open Government reviews the opportunity of open government, how technology enables open government, and how to make government more transparent, participatory and collaborative.